For any elastic balloon, the pressure inside is always a little greater than the pressure outside, since the rubber exerts a restoring force inwards. For maximum lift, we want to minimise the density of the gas inside the balloon, so this extra pressure is not desirable. My goal was to model how much of an effect this has on the lift produced. I will work through an example using a Novalynx 400-8242 balloon. The reason I have chosen this balloon is that test data is readily available on the web page. pout, the pressure outside the balloon, is a function of height and can be approximated from a standard atmospheric model. pin can be calculated from the gas law, as a function of the number of moles of gas in the balloon (a constant throughout the ascent), the volume of the balloon, and temperature. In order to calculate Δp, we need a stress-strain model of the balloon rubber [1,2]. Here we use two well-known hyperelasticity models: the Mooney-Rivlin model and the Gent model. 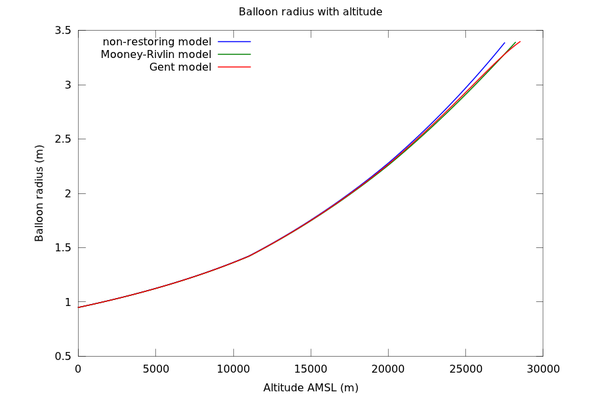 The Gent model has the advantage of modelling the stiffening that occurs as the rubber approaches breaking point, but the parameters are more difficult to determine accurately without performing destructive balloon measurements. We use the typical values given in  for the shear modulus μ and the parameter α (μ=300 kPa and α=10/11). In the Gent model, only the final term in parentheses is different; it includes a Jm parameter related to the maximum possible stretch. By setting r to the initial inflation radius at h=0, we can obtain n (the number of moles of gas in the balloon). Then, we can solve the above equation for r at each altitude h.
Figure 1 shows the resulting graph of balloon radius vs height. 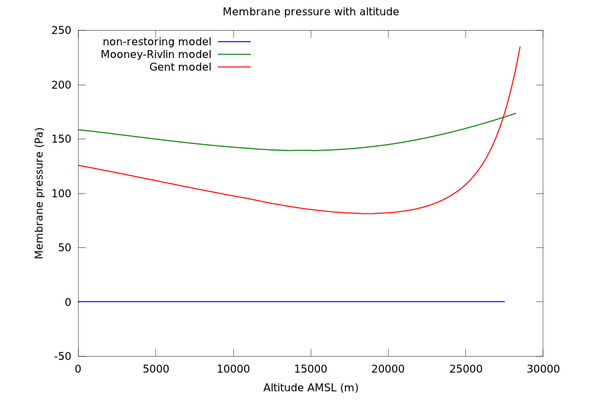 As well as the Mooney-Rivlin model and the Gent model, the graph also includes a purely theoretical non-restoring model, in which the balloon exerts no restoring force at all (Δp=0). The burst radius of the balloon is given by the manufacturer as 3.4m. This occurs at 27.5km for the non-restoring model, 28.2km for the Mooney-Rivlin model and 28.5km for the Gent model with the chosen parameters. All of these figures are close to the performance test data, which indicates a burst height of 28km. So it does not seem that elasticity has much of an effect on the ceiling in this particular example. For the type of balloon at hand (with given t0/r0), it can be seen that the membrane pressure is of the order of 100-200 Pa throughout the flight envelope. This means that the difference in pressure between inside and outside is negligible at low altitudes (sea level pressure is of the order of 100,000 Pa). However, at high altitudes it may start to become important. At 28km the pressure has fallen to 1600 Pa; at 40km it is 290 Pa. In the non-restoring model with no pressure difference between inside and outside, constant lift is maintained. However, this is not true when elasticity is considered. 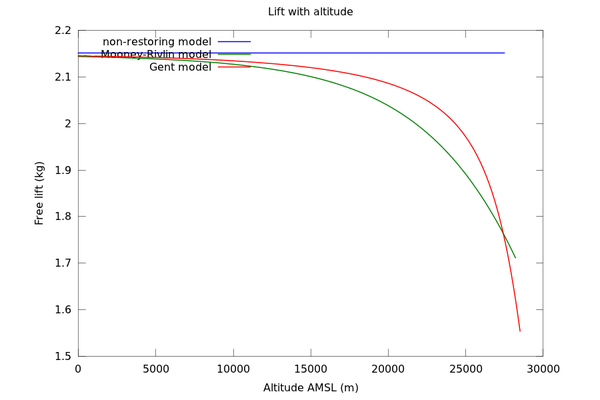 In the case of the Gent model the free lift drops from 2.1kg to 1.5kg as the balloon approaches its burst point (the exact value has some uncertainty due to choice of Gent model parameters). In the present example this is not sufficient to arrest the ascent of the balloon, but it may be important to consider if the target altitude is higher and/or the balloon already has marginal lift performance. The Octave/MATLAB functions used to plot these graphs are available here. What about lots of rubber gloves? Ha. Someone suggested condoms. It’s a lot of extra rubber compared to a single sphere though — apart from the story factor, a balloon seems rather more fit-for-purpose. So it seems to me that you like to fly balloons, at least from a theoretical point of view, don’t you? Have you ever thought in the challenge of a “cuasipermanent staratospheric balloon” ? -55 ºC all the time affects the material. Maybe the antartic balloons use by NASA https://www.nasa.gov/content/goddard/nasa-funded-science-balloons-launch-in-antarctica/#.VVCiLeGXz3c, could be the answer to this challenge. Do you now if someone could buy one of this and where? 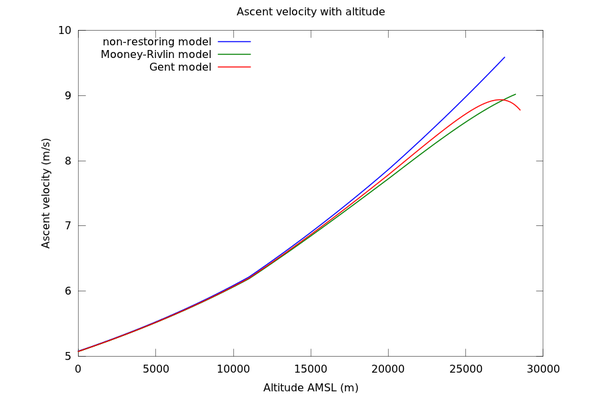 Why is 300m/min the desired ascent rate for weather balloons?